A Clown birthday party is so much fun and kids love them. There has to be a Clown, either you get a professional circus Clown at your party or you dress up as one and learn some tricks. Now lets start planning. To make this Clown birthday party invitation you need to blow up a balloon and write the party information on it with permanent markers. When done deflate the balloon and put it in an envelope with a handful of confetti. If you want, you can include a small note telling guests to blow up the balloon to read the party information. To make this Clown birthday party invitation you need to find a nice looking Clown face picture on the internet. Print it out and put different coloured glitter glue on the face of the Clown so the Clown's face shines. For example if the nose of the Clown is green put green litter on it, if the mouth is red put red glitter on it, etc. I am having a Clown Birthday Party! Come and Join Us in the Fun! There will be Face Painting and more Fun! At this Clown birthday party the birthday girls should dress up as a Clown and have her face painted as a Clown. When guests arrive transform them into Clowns. Make, buy or rent circus Clown accessories, such red noses, bow ties, wigs, white gloves, etc. The theme colours for this Clown birthday party are red, blue, and yellow. Decorate the party area with lots of balloons and streamers in the theme colours. Have lots of colourful streamers hanging down from the entrance of a door. So the kids have to go through it every time they go from one room to another. Decorate your house with Clown posters on the walls and front door and use really cool colour sheets on the walls. Place stuffed animals all around the party area. A good idea is to set up a small circus tent inside the party room. Put lots of big pillows (red, blue and yellow) under the tent, so the kids can sit there. Use a red table cover and paper plates, paper cups with circus Clowns on them. Decorate the table with toy Clowns and lots of confetti stars. For centrepiece have a Clown cupcake tree. Frost cupcakes to look like clown faces and put them on a silver cupcake tower (you will find this at party stores). Place the cupcake tower in the middle of the table. 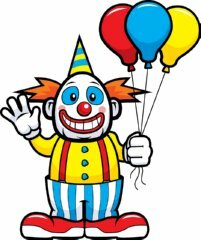 A good idea is to have a Clown holding a bouquet of helium balloons at the entrance to give to each child as they arrive to the Clown birthday party. And lastly don't forget to have marching music playing in the background. As guests arrive transform them into small Clowns. First stop is the wardrobe station were the little guests will be dressed up as Clowns. You need to have a big box full of Clown clothes that the kids can choose from. The second station is the mini-maker over table, were kids will get face painted as Clowns. Have a parent or teen help you with the face painting, each kid should receive a red nose, pink cheeks, arched browns, and a big smile. You can also paint stars or moons on the cheeks of the children. Divide the kids into two pairs. Line all pairs up at the starting line. The pairs have to stand back to back at the starting line. Place a balloon between the pairs legs, they have to squish the balloon from keeping it to fall down. Start the game by counting to three, the first pair to reach the finishing line with the balloon between their legs wins. If the balloon breaks or falls the pair have to return to the starting line to get a new balloon. This game is best played outside. Divide the kids into two groups. Ask the kids to put on their original clothes. At the opposite side of the starting line their has to be two Clown outfits. The first team member to start from each team has to run to the other side, get dressed in the Clown clothes and then run back to it's team members and get the Clown clothes off. Next team member has to put the Clown clothes on, run to the other side, take the Clown clothes off and run back to is team members, etc. The first team to finish, wins the game. Give each child a pie at the beginning of the game. Count to three, the child who finishes the pie the fastest, wins the game. All children don't have to compete as some may not like this game. This game is especially fun for the boys at the party. Clown birthday party game similar to Hot Potato, but played with a balloon filled with water. This game should be played outdoors. Invite the kids to form a circle while music is playing in the background. Give a balloon filled with water to one of the kids, the kid has to pass the balloon over to the next player or who ever he wants to pass it to as soon as possible. Stop the music, the kid holding the balloon is out of the game. Start the game again and play until there is one player left. Have a small price ready for the winner. Beforehand paint a clown face on a large cardboard box and cut out a big mouth. Set the box in the middle of the party room. Give the first kid to go two beanbags. He has to try to throw the beanbag through the mouth hole on the Clown's face. Have the kids perform simple stunts. Before they do this let the Clown teach the kids simple stunts. When the kids are ready let them perform in groups in front of the other kids and parents with the help of the Clown. Kids love piñatas and it's lots of fun. Fill the piñata with Clown related small items and lots of candy. Finish the party of with a Clown story. We have lots of yummy food ideas below, pick the ideas you fancy the most. Elephant & Monkey Sandwiches: Serve sandwiches filled with peanut butter and banana. Shaped Sandwiches: With the help of different shaped cookie cutters make different shaped sandwiches such as stars, moons, hearts, etc. Clown Cones: Fill a sugar cone with 1 or 2 balls of ice cream. Place the sugar cones upside down on top of a mini cupcake. The cone is the Clown hat and the mini cupcake is the face. Decorate the Clown face with icing. This is a really yummy treat. Clown Cupcakes: Frost cupcakes to look like Clown faces. Clown Bananas: Serve bananas rolled in peanut butter with chocolate sauce. Why not surprise the kids with handwritten jokes at their place settings, it's lots of fun and it gives the kids a chance to laugh. Buy or make yummy cupcakes. If you make them remove the old baking cups and put new baking cups on the cupcakes. Frost the cupcakes with white icing - the Clowns face. Using cake writing gel decorate the face features. To make this Clown birthday party cake you need to make a round cake, fill it with vanilla and chocolate cream filling. Frost the cake all red. Put it in the fridge for at least 7 hours. Cut out a picture of a Clown from a clipart, paper plate, etc. Place the picture on top of the frosted cake. Trace the outline of the Clowns body with a toothpick. When done remove the picture from the cake. Using cake writing gel, trace the Clowns face outlines, etc. Use the picture of the Clown for guidance when applying colour gel to the clowns hair, eyes, skin, etc. To make these Clown goody bags your need to buy red, yellow, green and blue coloured bandanas. Place the favors in the middle of the bandana, close the bandana and tie the bags with a ribbon (same colour as the bandana). You will have different coloured goody bags. Fill the Clown birthday party goody bags with clown accessories such as: small joke books, Clown stickers, noisemakers, candy, funny dress-up items such as Clown noses, bow ties, ect. At the party take lots of pictures of the guests with the Clown. Send these pictures out to corresponding guest, with a small note saying something like "Thank You For Coming TO My Clown Birthday Party"
I hope our Clown birthday party ideas will help you in your planning and I hope your little princess will love her Clown birthday party.